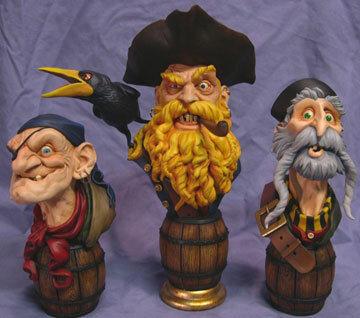 The first two “Sea Dogs” sell for $75 plus shipping; price on the Captain is $85; the set of all three is $175. Kits in pictures painted by Phil Sera. The truth about pirates was ugly. They were thieves and murderers sailing the high seas, and the closest thing they probably got to taking a bath was the occasional saltwater spray from the waves. No fun at all. But the iconic images of pirates built around sources such as the Pirates of the Caribbean and Robert Louis Stevenson’s “Treasure Island” – that’s fun. 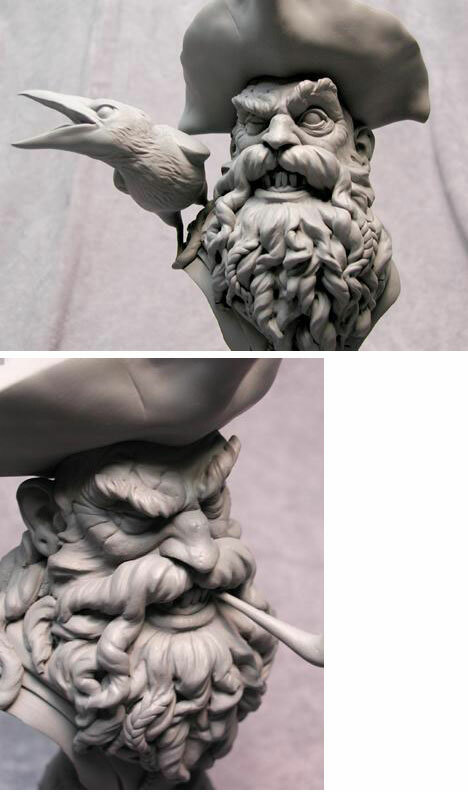 Sculptor Andy Bergholtz celebrates those iconic images with his “Salty Sea Dogs,” a trio of buccaneers who are obviously very happy about being very bad. They’ve never had what Andy calls “official” names, but he refers to them as the Captain (the most recently introduced), Deadeye Henry and Frosty Bill. Andy, 27, lives in St. Louis. He’s married and has kids: Lucy, 3; Andy Jr., 18 months; and a third on the way. Norm “Kitman” Piatt wrote a terrific interview with Andy in the Spring 2004 issue of the now-defunct Modeler’s Resource. The magazine doesn’t seem to be available through the MR Web site, but it’s worth searching for you if you want a more in-depth piece about Andy. For now, I’ll share what he told me through e-mail. Resin the Barbarian: Were the Sea Dogs based on some kind of illustration? 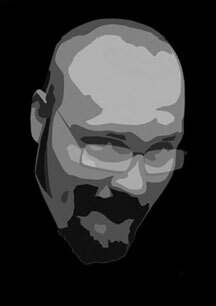 Andy: I didn’t use any illustrations as a basis for the designs, they are all original. I was heavily inspired by imagery from the Pirates of the Caribbean Disneyland attraction, which has always been an obsession of mine. Old-school Disneyana is kind of a hobby for me, I’m a huge fan of anything related to the Pirates or Haunted Mansion, etc. 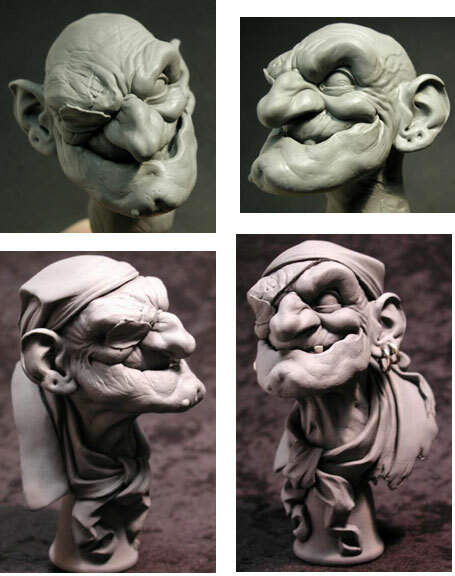 These busts are in large part an homage to the old greats like Marc Davis and Blaine Gibson. RtB: The first two “Salty Sea Dogs” have been around for more than a year; the Captain is new. How long, roughly, did it take from the first, “let’s do this” step when you (and Robb, I resume) decided to do this until now, when all three are ready? Andy: Well, the first two busts were not planned, they were just clay sketches I had done for my personal collection at the time. 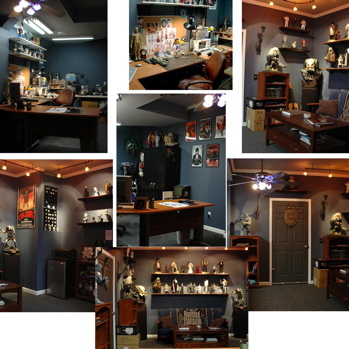 They got such great feedback on the forums, etc, and I began to get all kinds of requests to turn them into kits… I’m not much of a kit producer myself, but I knew my buddy Robb (Rotondi of Dark Carnival) was a huge pirate fan, so I pitched it to him and he picked them up to produce. I had always intended to do a third pirate, which we decided would be the Captain, to finish off the set. That piece took considerably longer to complete, partly because he’s a little more complex than the others but mainly due to scheduling. 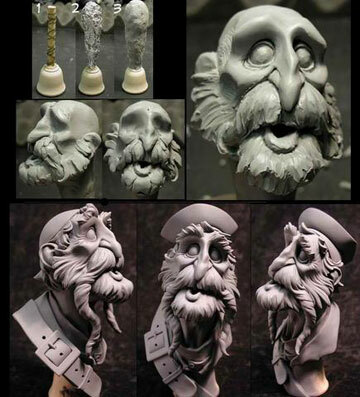 RtB: How many hours a day do you sculpt? And WHAT hours of the day? 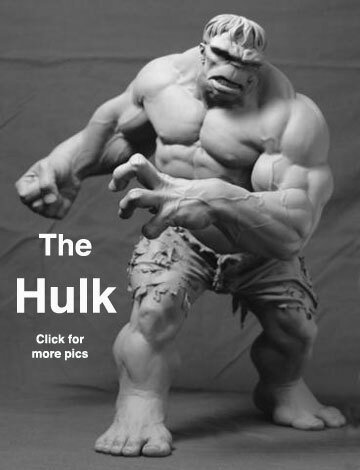 RtB: I would suppose that, as sculptors go, you are doing well. 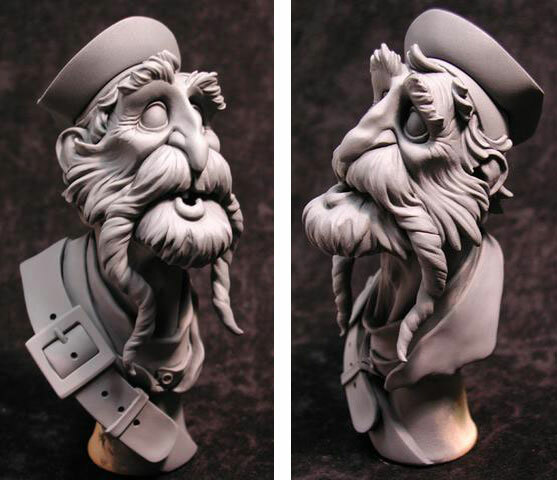 Would you say sculpting pays well, or do you have to worry a lot about where the next job is coming from? Andy: I’m blessed to be in a situation currently where I don’t worry about where the next job is coming from, although it wasn’t always that way. Like most artists I spent my fair share of time struggling with work and living off beans and Kool-Aid. The industry has been good to me over the years, though, and I’m constantly surprised and humbled by my level of success. 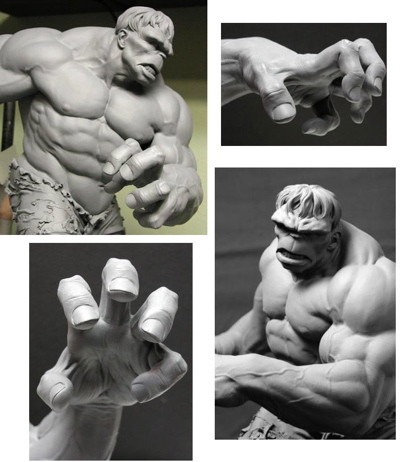 RtB: You sculpt many well-known characters, including comic-book heroes, movie monsters, etc. Do you consider yourself in a sort of good-spirited competition with other sculptors to “top” each other’s work? Do you ever look at “Mr. X’s” newest version of the Frankenstein Monster and try to “beat” that? That’s not to say there aren’t many sculptors out there who aren’t competitive … Some of them can be downright cutthroat when it comes to competing for work. 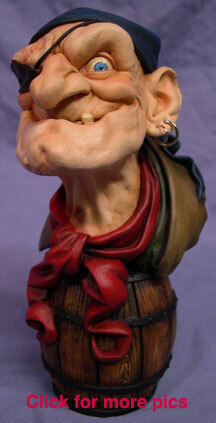 But the sculptors I’m closest with (whose work spans the entire industry), it’s all very positive and kind-spirited. I wouldn’t say that I consciously try to “top” other sculptors’ work, but I’m always amazed when artists create a piece that raises the bar of expectation, and it definitely inspires me to do my best with each new piece. RtB: What can fans expect from you as 2006 progresses? Do you have any in-progress works you can tell me about, maybe share a photo or 20? Andy: Unfortunately I can’t be too specific due to the nature of the licensed work … But I can say there will be a bit more variety in my portfolio in the coming months. I recently entered the freelance market again and am no longer exclusive with Sideshow Collectibles, which has opened up many opportunities to expand the types of work I do. I’m still working on a great deal of Star Wars and Lord of the Rings pieces for Sideshow, but I’ve also got some projects for DC Comics in the works, and even Disney. 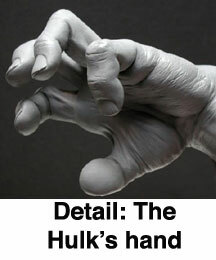 One piece I can share is the 1/4 scale Incredible Hulk that was recently announced by Sideshow. The sculpture is a couple years old, but I’m still fairly fond of it. 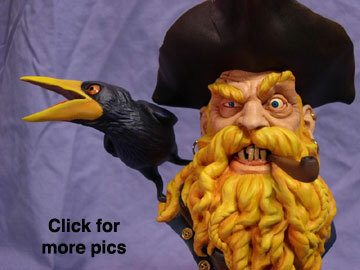 This article was posted in 2006 archive, Resin, Sculptors, Swashbucklers and buccaneers and tagged Needful Things. Bookmark the permalink. Follow comments with the RSS feed for this post. Both comments and trackbacks are closed.